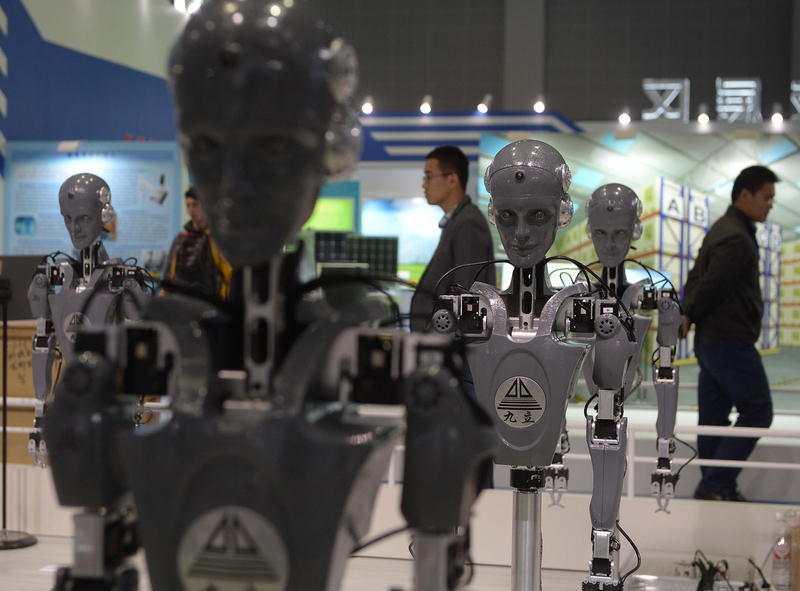 Industrial robots on display at the National Exhibition and Convention Center in Shanghai, November 2, 2015. Alex Joske is a Researcher at the Australian Strategic Policy Institute’s International Cyber Policy Centre. His work examines Chinese Communist Party political influence and technology transfer. As trade tensions between the United States and China worsen, a new technological cold war looms, casting its shadow over American universities and research institutions. Earlier this year, the National Defense Authorization Act included a murky provision prohibiting the Department of Defense from making grants to researchers who participate in China’s talent recruitment programs. In June, the State Department placed new limitations on Chinese researchers in the U.S., including shortening the duration of student visas in some high-tech fields. More recently, Johns Hopkins University School of Medicine reportedly suspended a visiting scientist program primarily aimed at Chinese scientists. Chinese researchers face increasing difficulty in accessing national laboratories in the U.S., and the Trump administration may be considering further restrictions. At the same time, Chinese scientists are making strides in indigenous research, at times raising ethical concerns. In late November, Chinese scientists announced the world’s first babies born from embryos modified with CRISPR gene-editing technology. One American scientist reportedly took part in the experiment, despite the ban on this type of research in the U.S.
“The motherland needs you. The motherland welcomes you. The motherland places her hope in you.” In red, bold characters, these three sentences appear at the top of the homepage for the “Thousand Talent Plan,” the Chinese government’s flagship overseas talent recruitment program. By invoking a sense of blood and belonging to attract overseas scientists of Chinese origin to return to their ancestral “motherland,” the Chinese government is reaffirming its stance that a scientist’s highest calling is in service to one’s country and people. The Communist government’s reliance on foreign-trained talent for its science and technology sector is as old as the People’s Republic itself. Most of the scientific and technological leaders in 1950s China received advanced degrees in the U.S. or Europe before returning to help the war-torn nation rebuild. Nevertheless, the scientists’ patriotism and service could not protect them when political winds turned. From the anti-rightist campaigns to the Cultural Revolution, scientists were among the most persecuted groups in China. Chinese scientists today are well aware of this recent history. Compared with the idealism of their predecessors, they are usually more pragmatic. Like peers from other countries, Chinese scientists choose their profession out of curiosity about nature, and decide where to study or work for career advancement and other personal reasons. There have been cases where Chinese scientists working in another country violated intellectual property or committed industrial espionage, and they should be rightfully investigated and prosecuted. However, it would be wrong to generalize from these isolated incidents that any Chinese scientist with overseas experience who returns to China is potentially “stealing” technology for the Chinese state. The parochial notion that any country or government can be in ownership of a scientific discovery is antithetical to the cosmopolitan ideal of science. Whether it is the splitting of an atom or slicing of a gene, the potential risks from new technology recognize no national borders. Seeing science only as a tool of national greatness will not only hurt the advancement of science as a global enterprise, but also make the world less safe when ambition trumps ethics. From the military build-up in the South China Sea, to the high-tech ethnic cleansing campaign in the northwestern region of Xinjiang, the Chinese government’s pursuit of advanced technology is for both external defense and internal suppression. Chinese scientists who work on technology with dual-use potential are contributing to both state aggression and their own oppression, a difficult reality that is not lost on many Chinese scientists themselves. Their sense of patriotism and national belonging do not equate a blind acceptance of government policy, despite their lack of ability to dissent or disobey in an authoritarian state. The U.S. should see its liberal democratic system as a strength, and lead by example in fostering more open collaboration and transparent process. The international community should welcome Chinese scientists to the table in devising global norms of ethical development and peaceful use of technology, and hold the Chinese government accountable to such standards. Cold War-era tensions that halted scientific collaboration between the USSR and Western countries appear to be making a comeback between China and the U.S. The Chinese government has put science and technology (S&T) development at the heart of its national rejuvenation strategy. A key piece of this effort is overseas talent recruitment, where money isn’t always enough to woo top talent. Scientific research in China is almost exclusively government-funded. Cumbersome bureaucracy remains a source of frustration for scientists, though the situation has been improving with the government’s determination to make China a “scientific and technological superpower.” Education or work experience overseas brings a certain degree of prestige in China, which can complicate relationships between foreign and domestic trained talent. The Chinese government’s tightening ideological grip in recent years can give a serious reverse cultural shock to many of the “overseas returnees.” With rising authoritarianism in their birth country, and the tensions in the U.S. due to the escalating trade war, many Chinese scientists in the U.S. find themselves between a rock and a hard place. Scientists are aware of the social cost and dual-use potential of their work. However, the pace of the competition and the goal to “surpass” others, whether on an individual level or national level, can lead to dangerous ethical lapses, as seen in both the Chinese and U.S. scientific communities recently. In recent years, the U.S. government has shown its distrust of ethnic Chinese scientists. Espionage cases involving naturalized American scientists of Chinese origin are not uncommon. A number of high-profile acquittals had a chilling effect on the scientific community: if sharing an unrestricted design for day-to-day research warrants a Department of Justice investigation, has politics gone too far in having a negative effect on scientific collaborations? Racial bias and xenophobia also affect higher education in the U.S., where overall international student enrollment continues to drop. Meanwhile, rising Chinese student enrollment in the U.S. has slowed in recent years, and the U.S. has been issuing fewer student visas, foreboding a declining trend. Technical immigration visas are also becoming increasingly slow and restrictive. Amid the surging waves of global talent recruitment efforts by many other countries, U.S. policy has left people scratching their heads: if the secret sauce to the success of the United States is the ability to attract and retain “the best and the brightest,” why is it shooting itself in the foot today? Many scientists choose their profession because they enjoy the beauty of science, and see the value of spreading science beyond party lines or national borders. If the U.S. shuts the door, the rest of the world is still open. Scientific research, especially fundamental research, repels parochialism and demands a free flow of information. If the Chinese government’s intention indeed constitutes a threat to the free world, the current espionage paranoia in the U.S. only does more harm than good at retaining talent and upholding the sanctity of science. The Trump administration’s anti-immigrant stance has negatively affected U.S. universities’ ability to recruit and retain top international scholars. The attempt appears to be more of a political maneuver than a security one. Much like most internationals in the U.S., the vast majority of Chinese scholars choose the U.S. to simply obtain a high-quality education and experience that they can then use towards bettering their personal futures. Unfortunately, the Chinese have been increasingly perceived as U.S. threats despite limited evidence. Xenophobic and neo-racist fears position Chinese researchers as intellectual thieves without acknowledgement of the extent and benefits of international collaboration. Such anti-immigrant stances also fail to consider ways that research is internationally interdependent in the current global society. Travel bans and suspending programs will likely have little effect on the actual transfer or sharing of intellectual property but may provide a false sense of security despite the fact that knowledge is inherently open, not owned. As the leading country in scientific knowledge production, the U.S. has much more to lose than to gain in regards to its international competitiveness and global status by limiting Chinese researchers’ visas. For Chinese scholars who are seeking scholarly opportunities and collaborations with U.S. universities, they must now weigh in current political uncertainties in deciding whether to stay home or go elsewhere. Regardless of where future Chinese researchers choose to go in the future, science, as a global enterprise, will be largely unaffected. With fewer Chinese researchers, the host institution and country will likely suffer, but the broader field of science will continue to flourish. The problem has been that scientific research has become a geopolitical tool that positions countries against one another rather than as knowledge production that benefits the world in solving global problems. The larger, international scientific community should rise beyond political power plays and support safe spaces in the world where academics have the freedom to do excellent research and resist serving as political pawns. While science is a global enterprise, countries like the U.S. and China have different strategic interests that have implications for scientific research. China’s politicization and militarization of research should be driving serious recalibrations of engagement in this area. Governments, universities, and researchers across the globe have often embraced scientific engagement with China without enough consideration of its security and ethical implications. For example, my recent report on the Chinese military’s collaboration with overseas universities, “Picking Flowers, Making Honey,” found that over 2,500 People’s Liberation Army (P.L.A.) scientists have been sent to work or study abroad in the past decade, but many universities and governments appear to not fully understand this large-scale activity. The rise in the P.L.A.’s overseas research ties is just one aspect of China’s policy of military-civil fusion, which seeks to fuse defense and civilian industry and leverage civilian expertise for military ends. Under military-civil fusion, China’s civilian universities and companies are deepening their engagement with the military, making it harder to draw a line between civilian and military research. Military-civil fusion offers a clearer picture of the risks from research collaboration with China than approaches based on concepts like dual-use technology and distinctions between fundamental and applied research. Some Chinese universities also appear to be working closely with China’s intelligence agencies to carry out industrial espionage, as illustrated by recent U.S. indictments showing the Ministry of State Security partnering with Nanjing University of Aeronautics and Astronautics to steal aviation technology from U.S. companies. At the same time, the Chinese government has heavily invested in overseas talent recruitment, encouraging ethnic Chinese scientists to work in China through initiatives like the Thousand Talents Plan, which has had over 7,000 participants since its creation in 2008. Governments and universities must incorporate an understanding of these issues into their policies and strike a balance between mitigating risks and maximizing benefits. Collaboration in surveillance and security technology may be contributing to China’s suppression of freedom and illegal detention of hundreds of thousands of Muslims in Xinjiang. By ignoring military-civil fusion and China’s talent recruitment efforts, universities risk harming their relationships with funders of research and losing intellectual property. Moving forward, government and universities need to be mindful of the intent of China’s research collaboration, how research is being applied in China, and who the end-users of such research are. Xi Jinping’s continued pursuit of military-civil fusion and efforts to leverage overseas Chinese present many difficulties. In a globalized world where many scientists of Chinese origin work outside of China, any response must be careful not to stigmatize Chinese people. To deal with these concerns, it will be important to promote open discussions that foster precise policy responses while avoiding self-defeating or xenophobic ones. An effective approach would target the structures and institutions responsible for many of these risks, such as organizations involved in promoting the Thousand Talents Plan. Incentives for bright Chinese scientists to stay in the West and funding for important fields should also be emphasized. Tensions between the U.S. and China have been escalating in recent years, and the academy has not been immune. In 2013, the Communist Party circulated a memo known as Document 9. This document laid out in no uncertain terms that Chinese universities needed to be vigilant in the fight against “Western” values such as democracy and civil society. Since the release of that document, the Party has severely constrained the space for academic inquiry and expression in the social sciences. Unfortunately, the Trump administration has recently been doing its best to mirror this xenophobic and illiberal behavior. Of course, the U.S. federal government does not have the same capacity to restrict speech, but Chinese scientists have faced growing repression justified on grounds of “national security.” Even more worrying, the Trump administration reportedly considered the transparently racist option of banning visas for all Chinese students. This growing hostility to the free flows of ideas and people holds grave implications for both countries. After many academic departments were largely shuttered during the Cultural Revolution, interactions with foreign academics was critical in rebuilding China’s social sciences in the reform era. Many of the professors running China’s elite departments were trained in the West, and particularly in the U.S.
U.S. universities have also benefitted by attracting some of the best students in China, a particular boon for those of us engaged in China studies. While many have a stereotypical image of Chinese students in the U.S. as focused on engineering and natural sciences, in fact the social sciences and humanities have also benefitted immensely from this influx. Academic engagement should not be without conditions—as I have argued elsewhere, any partnership must take place on a foundation of shared principles. Here at Cornell’s School of Industrial and Labor Relations, we recently decided to suspend an exchange program with Renmin University as a result of their repeated violations of academic freedom. Certain professional and ethical principles must be maintained in order to ensure academic excellence, irrespective of nation. There are concrete implications for scientific exchange when we commit to academic freedom. First, we must do everything possible to resist the efforts of the U.S. federal government to limit visas for Chinese and other foreign students and scholars. Academic freedom means little if the interlocuters have been pre-selected by a paranoia-driven and exclusionary political logic. Second, U.S. institutions must be prepared to disrupt business as usual. Very real challenges to academic freedom exist both domestically and in China where the state has been actively trying to prevent democratic values from infiltrating its universities—precisely the values that supposedly underpin the U.S. academy. This is not a surprise: the Party put its intentions on paper, and they are now meticulously stamping out remaining critical voices. This is an important moment for U.S. and other foreign universities. Do we allow our principles to gather dust in the attics of our institutions, or do we put them into practice?